Twitter is blowing up about the questionable Chinese-themed dressing at the Met Gala. Instead of wearing Chinese designers, a majority of attendees simply wore culturally misappropriated gowns inspired by the idea of Chinese culture. Rihanna was the only celeb who actually did it right. She gets it. You will be much less likely to offend people if you wear a Chinese designer to an event celebrating Chinese designers. Fun fact, guys! 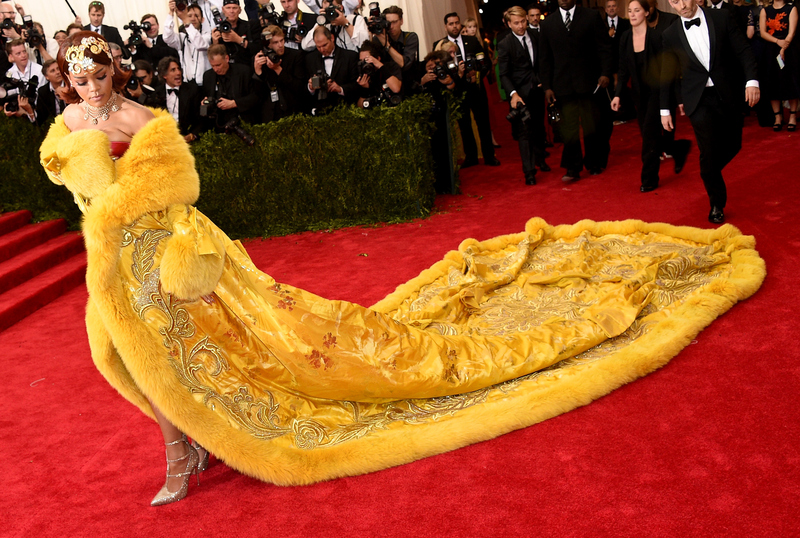 Rihanna wore a yellow cape by Guo Pei to the Met Gala and basically won the internet over. It's honestly pretty disappointing that more Met Gala attendees didn't think of this, and instead wore Chinese-inspired gowns by Ralph Lauren or Michael Kors. Instead of trying to "match" the theme, they could have easily respected Chinese culture by asking a Chinese designer to design them a gown for the event. While Eva Chen was certainly not the first person to point out the fact that Chinese designers were underrepresented at the Met Gala, she was one of the most influential tweeters to call attention to this issue. She tweeted "Bravo to @Rihanna for actually wearing a Chinese designer (yet [sad emoji] at the lack of representation from other celebs)" which quickly pinpointed the issue and provided a solution for dressing appropriately for the theme. Too bad more people didn't think of that earlier. Rock on, Rihanna. You win, Met Gala 2015!